Tyler Perry's Madea Goes to Jail is a 2009 American comedy-drama film written and directed by Tyler Perry, which was based on his 2006 play. The play and the film deal with Perry's signature character Madea going to prison for her uncontrollable anger management problems. The film was released on February 20, 2009. After a high-speed freeway police chase (seen in Meet the Browns) results in Madea being pulled over and arrested (though she is not convicted due to a legal loophole, as the officers failed to read her her Miranda warning), she admits her permanent license suspension and Judge Mablean Ephriam places her in an anger management course. Returning home from court, Madea finds a party taking place in her house hosted by her brother, Joe Simmons, who claims he threw the party to try and cheer up Madea. However, Madea isn't amused by the festivities and uses a machine gun to scare the party goers away. Madea consults with Doctor Phil McGraw for anger management, but does not cooperate with McGraw. Returning home, Madea, needing to buy groceries, calls Cora to drive her to the store, but Cora declines, angering Madea. Joe predicts that Madea will get into trouble if she drives to the store herself, but Madea ignores him and goes anyway. At Kmart, a woman steals the parking space that Madea was about to take and acts very snobbish to Madea when she confronts the woman over it, so Madea commandeers a forklift truck to remove the woman's car from the space, wrecking the car in the process. Madea is arrested and brought to court again, where Judge Greg Mathis sentences her to prison for five to ten years. Meanwhile, assistant district attorney Joshua Hardaway is on the fast track to career success. He is prosecuting a young prostitute and drug addict, Candace "Candy" Washington, with whom he is already acquainted. Josh asks his fiancée and fellow ADA Linda Davis to fill in on his behalf. But when Josh takes Candy out to eat and gives her his business card for future assistance, Linda gets jealous and fears Josh may be cheating on her. Although Josh tries to assure her that he is only trying to help an old friend, Linda tells him that it was Candace's own fault for being who she is and that he should only socialize with a higher class of people. Josh, however, keeps helping Candace anyway, to the point where he rescues her from a pimp and brings her to his home to spend the night. When Linda finds out, she gets furious and threatens to leave him unless he puts Candace out of his life for good. Conversely, Candace sees right through Linda upon meeting her and tells Josh that it will never work between them since they are too different: Josh actually cares about helping anyone he sees in trouble no matter their class, while Linda is a shallow and spoiled brat who considers people who have a lower status than her as inferior. Josh later runs into his friend Ellen, a former drug addict and prostitute who has now become a minister that helps other women get off the streets. After Josh asks Ellen to help Candace, Ellen gets her a job interview, but it results in sexual harassment by the interviewer, who Candace kicks in the groin before storming out. Just before Madea's trial, Ellen asks Josh how he knows Candace. He tells Ellen that they were close friends from childhood through college, but during their college years, all of Josh's friends mistreated and bullied Candace because of her background and he started pushing her away out of embarrassment. He breaks down when he talks about one particular night when he took her to a party. He ended up going on a date and leaving Candace behind at the party, where a group of his friends gang-raped her in his absence. Since then, Josh has continued to harbor deep-seated guilt for leaving her behind and failing to protect her. Ellen comforts him and tells him that he shouldn't continue holding on to the guilt and that it was never his fault, especially since Candace already had personal troubles beforehand. At the district attorney's office, Josh's best friend, Chuck, runs into Linda and discovers that she is falsifying Candace's file to deliberately get her sent to prison and away from Josh, a practice she has been engaged with other defendants as well, including Madea. Linda blackmails him to keep his mouth shut under the threat of telling their and Josh's boss, the head A.D.A. that Chuck cheated on his bar exam to get his job. Candace refuses to show up to her trial and returns to prostitution, until she is arrested by an undercover policeman. Due to Linda's falsifying of her file, the judge gives her a seventeen-year prison sentence. Linda later lies to Josh back at the office and tells him that she "tried" to be lenient, but that the case was too severe. Chuck overhears this and nearly tells Josh the truth, but hesitates because of Linda's previous threat towards him. While in prison, Madea befriends Candace and comes to her defense when she is sexually harassed by Big Sal. Candace, Madea, T.T. (Madea's cellmate) and Donna (Candace's fellow prostitute friend) attend a class taught by Ellen at the prison, in order to have time reduced from their sentences. During a lesson about forgiveness, Madea notices that some of the inmates would rather play victim instead of taking responsibility for their crimes. She tells the class they need to stop seeing themselves as victims and forgive those who led them onto the bad paths they've been on, as they weren't the ones who ended up in jail. Candace is moved by her words and during a visit with Josh, she admits that back when she was raped at the party he took her to, she called his name repeatedly as the attack happened, but he never came for her. Candace held on to her anger at him for so long that she forgot how to move on, which resulted in her dropping out of school and becoming a drug addict and prostitute. But with everything she learned from Ellen and Madea, she finally decides to forgive Josh and pick up the pieces of her life. On Josh's wedding day, Chuck, serving as best man, tells him that Linda falsified Candace's file. During the ceremony, Josh, appalled by Linda's deceit and fraud, tells the congregation, including their boss, the Mayor and the Governor what she has done and jilts her at the altar. Josh then rushes to the prison where he admits to Candace that he loves her and will help her get out of jail and restore her life. Because of the now-revealed news of Linda's tampering with client files, there is a public outcry and a protest movement gains momentum to set Madea, Candace and Linda's other defendants free. In the end, Candace, Madea and five other women that Linda prosecuted have their convictions overturned and are released, while Linda inevitably faces arrest, trial and imprisonment on multiple charges including fraud, evidence tampering and providing false legal documents. The film ends with Candace and Josh, now a couple, walking out of the prison and sharing a kiss in front of the press. The film received negative reviews from critics. Rotten Tomatoes gives the film a score of 28% based on 50 reviews, with an average score of 4.9/10. The consensus says, "Divided between sincere melodrama and populist comedy, Madea Goes to Jail fails to provide enough laughs – or screen time – for its titular heroine." Another review aggretator, Metacritic, gives the film a score of 50%, based on 13 reviews, meaning "mixed or average reviews". Sam Adams of the Chicago Tribune gave the film 2.5/4 stars and wrote that "if the movie is a mess, it's a purposeful mess, cannily, if not artfully, pushing all the right buttons to ensure Perry will be back for another round." According to a New York Times review, the film gives Madea herself a much more central role than some of the previous Madea movies, in some of which she is merely a commentator on events. The Boston Globe reported that "(Madea's) character epitomizes Perry's ongoing commitment to dramatizing as many rungs on the ladder of the black experience as he can. His aim never produces a completely satisfying or consistently competent-looking movie (his heart's in the right place, if not his camerawork)." On its opening weekend, the film opened at #1, and grossed $41,030,947 (2,032 theaters, $20,192 average), the biggest Friday to Sunday take since Twilight in November 2008. It broke Madea's Family Reunion weekend gross at $30 million as the highest weekend gross for a Tyler Perry film. It broke Saw III's record at $33 million for the highest weekend gross for Lionsgate Entertainment. "We were cautiously optimistic we could do 30-plus," Steve Rothenberg said. On its second weekend, it dropped 61 percent, but remained at #1 grossing another $16,175,926 (2,052 theaters, $7,883 average), bringing the 10-day gross to $64,525,548. The film closed on April 23, 2009 with a final domestic gross of $90,508,336. An exclusive preview was included on the cinematic release of Tyler Perry's The Family That Preys. Madea Goes to Jail was released on June 16, 2009 on DVD. According to DVDTown, the DVD included six behind-the-scenes featurettes. As of July 12, 2009, 1,125,422 DVD units have been sold, gathering revenue of $18,223,621. A Blu-ray version was released on November 23, 2010. ^ The Hollywood Reporter, 19 February 2009, p.26. 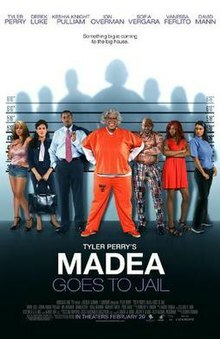 ^ a b "Tyler Perry's Madea Goes to Jail (2009)". Box Office Mojo. Retrieved 2009-04-06. ^ "Tyler Perry's Madea Goes to Jail Movie Reviews, Pictures". Rotten Tomatoes. Flixster. Retrieved 2012-09-17. ^ "Madea Goes to Jail (2009): Reviews". Metacritic. CBS. ^ "Tyler Perry's Madea Goes to Jail' stars Tyler Perry, Derek Luke, Ion Overman and Keshia Knight Pulliam". Chicago Tribune. 20 February 2009. Archived from the original on 24 February 2009. Retrieved 2009-02-21. ^ Scott, A. O. "Plus-Size Matriarch's Stretch in the Slammer", The New York Times, 20 February 2009. ^ Morris, Wesley. "Tyler Perry's Madea Goes to Jail: Once again, Perry has his moments in 'Madea Goes to Jail'", Boston Globe, 21 February 2009. ^ "Madea Goes to Jail Makes Out Like a Bandit". E! Online. Retrieved 2009-02-22. ^ "Weekend Box Office Results for February 27-March 1, 2009". Box Office Mojo. Retrieved 2009-03-01.